I'd been to a cousin's (Anu's) wedding, and was staying at this resort in Vallikkunnu (Near Parappanagadi/Calicut). The resort has many cottages, just by the beach. Shravan and I went for a walk on the beach in the morning, and among a few pictures that we took, I liked this one. Woowww that is a cool picture. 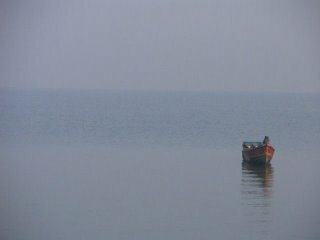 The lake fading into the mist in the horizon n then boat all by itself. Is this Anu ur cousin? she got married to a gujju guy aint she? The marriage happened in a resort ? n who is Shravan? yes, she's my cousin. no she married a guy from ghaziabad, near delhi. the marriage did not happen in a resort, but the groom's party, some friends of hers and I stayed in this resort overnight, before the wedding. shravan is a friend of hers, now i guess mine too.